Confused about if you should use a serum, or why you should use one? You’re not alone! Many people wonder what exactly a serum does for skin and how it differs from a moisturizer. 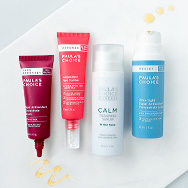 Paula’s Choice Skincare offers several serums, so we obviously feel they’re worth considering because of their specialized formulations. Here we explain what makes them unique and show you how to find the perfect serum for your skin care needs. What are the Benefits of Using a Serum? First, it’s important to know that all moisturizers, whether labeled as anti-aging or something else, should contain a premium balance of the beneficial ingredients we talk about all the time: antioxidants, skin-replenishing ingredients, soothing ingredients, and skin-restoring ingredients. We don’t want anyone to cheat their skin by using leave-on skin care products that don’t contain these precious ingredients, because they can help everyone’s skin look and feel better. Good serums also contain these exceptional ingredients, but serums are special because of the concentration of the ingredients they contain and their distinctive textures. The best serums contain high concentrations and blends of these research-proven ingredients. Along with this prestige fusion of ingredients, serums typically have a distinguishing smooth delicate lotion, gel-lotion, or silky fluid texture. Serums should apply easily and feel lightweight, even though the formula is packed with the best of the best. A great serum will be compatible with your moisturizer, complementing its benefits rather than competing with them. Do You Need a Serum and a Moisturizer? The answer is, maybe; it depends on your skin care needs. For some, just following the basic steps of our Paula’s Choice Skincare Essential Routine might be enough to accommodate their skin type and address minor concerns. For others, especially those with visible signs of aging, one of our Advanced Skincare Routines that also includes a serum, will produce enhanced results that build on the basics of cleansing, toning, exfoliating, protecting from sun exposure, and moisturizing. If you have more specific concerns, such as advanced signs of aging, uneven skin tone, pronounced dehydration, dry patches, or rough texture, a serum might be a good product for you to add. A well-formulated serum can take your skin care routine to the next level! Serums provide what your skin needs to look beautifully revived and renewed. Their fortifying qualities can make skin feel better and look healthier. You can use a serum twice per day: In the morning, apply it before your daytime moisturizer with sunscreen; at night, smooth it on before applying your nighttime moisturizer. You also can decide to use a serum only in the evening, applied before your moisturizer. It's up to you! For some people, especially those with oily skin, you may prefer to use a serum as the last step in your nighttime routine and let it serve as your nighttime "moisturizer." Serums can and should be applied around the eyes, too, and you can follow with an eye cream if desired. It also might be beneficial to alternate different serums or to layer them as needed for more customized results. That’s what many of us at Paula’s Choice Skincare do, as this is a great tactic if you can’t decide between two serums or if you feel that both could help your skin improve. Another reason this might be effective is because skin is not static; its needs can change for numerous reasons, such as seasonal changes, moving to a new climate, or the passage of time. At Paula’s Choice, we’ve developed a range of serums that vary in texture and potency. Their concentrated formulas can address advanced concerns, such as multiple signs of aging (including wrinkles), signs of environmental damage, loss of firmness, dehydrated, dull-looking skin, and uneven skin tone. The following guidelines can help you decide which serum is best for you. If you have questions, please call our Customer Care team or chat with us online. The team is well-trained and well-versed in Paula’s expertise, and would love to help you with professional advice! To visibly safeguard your skin from environmental assault, such as visible effects of pollution, we recommend our DEFENSE Antioxidant Pore Purifier. You can feel free to alternate or layer it with any other serums based on your skin’s needs. For normal to very dry skin, use our SKIN RECOVERY Super Antioxidant Concentrate Serum to provide antioxidants that protect from environmental assault and nourishing non-fragrant plant oils to relieve dryness. This serum also contains the anti-aging superstars retinol, vitamin C, and vitamin E.
For normal to dry or slightly dry skin, our RESIST Super Antioxidant Concentrate Serum is an ideal option. Those looking for a concentrated anti-aging serum, and who are sensitive to retinol, will find that this serum’s vitamin C and peptide-spiked formula works brilliantly. For signs of aging, large pores, and skin prone to clogs and bumps, use our oil-free RESIST Ultra-Light Super Antioxidant Concentrate Serum. The combination of niacinamide and hyaluronic acid smooth skin’s surface without leaving a slick or greasy feel. For normal to oily skin that tends toward clogged pores, our SKIN BALANCING Super Antioxidant Concentrate Serum is a weightless wonder to help safeguard skin’s appearance from environmental assault and quickly improve hydration with its feather-light touch. Its special texture helps minimize the look of large pores while retinol goes to work on wrinkles. To address more advanced signs of aging, or to alternate with any of the serums above, our RESIST Intensive Wrinkle-Repair Retinol Serum is an ultra-silky anti-aging formula celebrated for its nourishing mix of retinol and lush, smoothing hydrators. If you have extra-sensitive skin prone to redness, your skin will love our CALM Redness Relief Repairing Serum. This lightweight formula comforts skin and eases redness and is even gentle enough for those with rosacea and eczema, while delivering skin-replenishing ingredients like glycerin and ceramides.